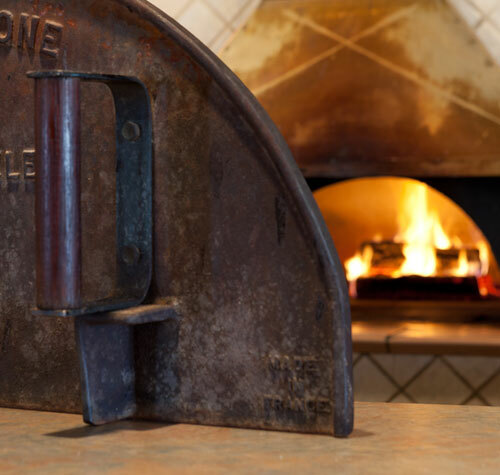 Our oven is an Earthstone™ wood-fired oven imported from France, it has no gas or electricity as a heat source, and we use only seasoned hardwoods. The oven was shipped to us in pieces and assembled by a local mason and then finished by a local tile setter. The oven floor itself consist of a 4” concrete pad with rebar, on top of that a 1” mixture of sand and Portland cement before placing the 1 ½” ceramic floor tiles on top. The oven is actually a dome in the shape of an igloo. The sides and top are approximately 6” thick of refectory cement and encased with a mixture of perlite and Portland cement 4” above the top of the dome creating an excellent heat sink. Our oven temperature typically reads 690 – 700 degrees although the temperature in the main chamber is closer to 850 – 900 degrees as the heat probe is approximately ¼’ from the dome surface. 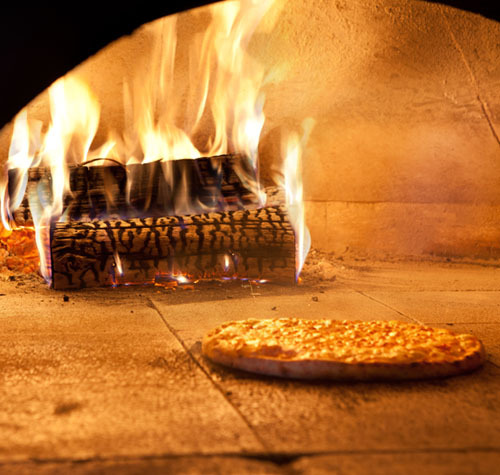 Our pizzas will cook anywhere from 3 to 5 minutes depending on the temperature and the size of the flame in the oven. At the end of the night we spread all the ashes evenly over the oven floor and place a heavy iron door in front of the oven to retain the heat, this also helps to clean the floor. The following day we start the oven about an hour prior to opening, the oven only loses between 150 to 200 degrees so that means we still have an oven with an internal temperature of 500 to 550 degrees. 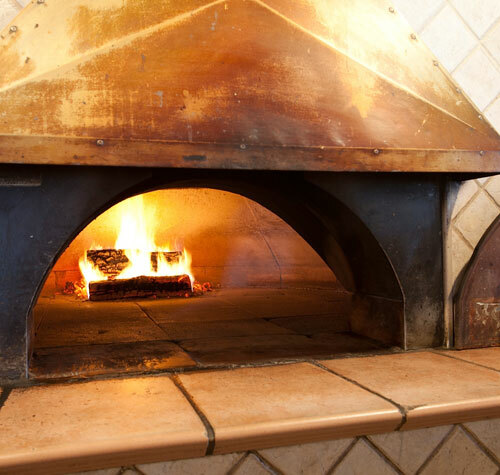 Why a wood-fired oven? 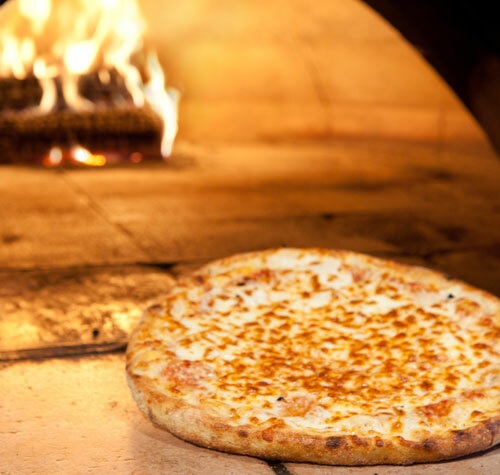 Unlike conventional ovens a wood-fired oven burns hotter, this intense heat sears and locks in the flavor of the food retaining the juices and prevents the food from drying out. This is what makes our pizza so flavorful and our crust so crunchy on the outside and chewy on the inside. The next time you come in be sure to walk up to the counter and check out our oven, and feel free to ask our cooks a question. Also, take a look at one of our old floor tiles that we have on display.